In this episode of ORIGINS, we take a look at local orchards, orchardists and a cider distillery. Our first panelist is Ben Wenk , the seventh generation partner/manager at Three Springs Fruit Farm based in Aspers, Pennsylvania. Three Springs attends local farmers markets, sells wholesale, and makes Ploughman brand hard cider. The Wenk family’s diversified farm grows a little bit of everything but specializes in apples and peaches. Our next panelist is Rob Miller, who together with his wife Patricia Power own Distillery Lane Ciderworks. They planted their first apple trees 16 years ago with a planting of 1000 trees. They’ve been adding trees ever since then and now have over 4000 trees of specialty American and European cider apples. They sell their hard ciders in Maryland, Virginia, Pennsylvania, D.C., and West Virginia. They operate a tasting room at their farm that is open every weekend. Our third panelist is Gwen Kokes, the Stewardship Coordinator at the BALTIMORE ORCHARD PROJECT which is a program of CIVIC WORKS. Gwen was the Project Specialist for the Baltimore Orchard Project where she conducted research, did some community organizing and volunteer management. Now, she organizes the Orchard Stewards Program, a network of trained orchardists, and makes Stewardship Year plans with participating Community Orchards. The Baltimore Orchard Project just planted its 1,000th tree! And….there are almost 100 orchards in Baltimore City alone. 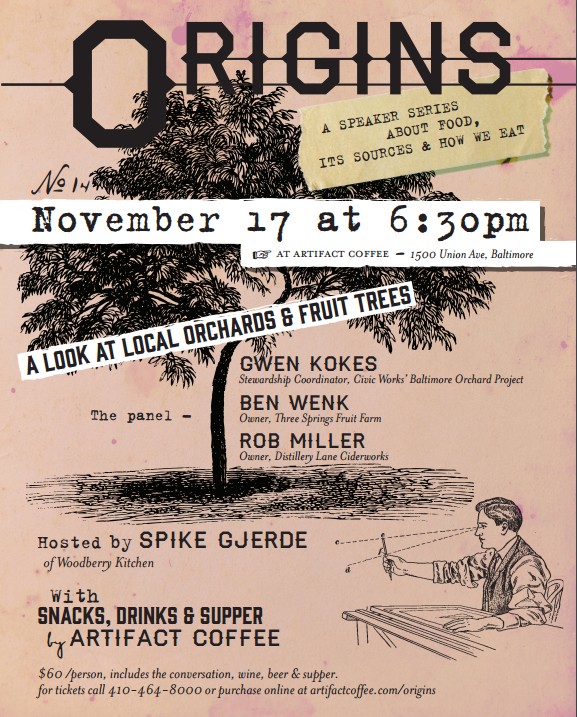 apple trees apples Baltimore Baltimore Orchard Project Ben Wenk cider Distillery Lane Ciderworks Farmer's Markets Gwen Kokes hard cider Orchard Stewards Program orchards Origins: A Speaker Series Patricia Power peaches Rob Miller Spike Gjerde Three Springs Fruit Farm Washington D.C. This episode will be on foraging in the mid-Atlantic area and features two longtime foragers, Jeff Long and Tom Mueller….